Thank you for visiting C&C Automatics. We have been the premier source for screw machine products in the Rochester, NY area since 1992. Our skilled machinists offer a wide range of machining capabilities, including Screw Machine Products ranging from 1/16" to 1 3/4" in diameter and up to 3 1/2" in length. Available materials include brass, aluminum, steels, stainless steels and some plastics. Let us meet your requirements from prototype to million piece runs. Have a unique need? Contact us to work with you. We are willing to go the extra mile to develop products to meet your specifications. 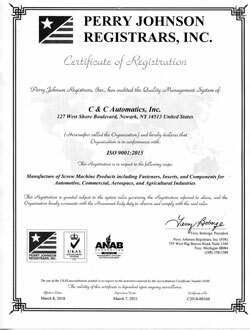 Thank you for considering C&C Automatics for your machining needs. We look forward to hearing from you. Copyright © 2019 C&C Automatics, Inc.